Unique forced air design utilizes fans (approx. every 12") across the entire back of the unit for even distribution of cold. Certified under NSF-7 to maintain temperatures in 86Â°F ambient and designed to maintain NSF-7 temperatures in 100Â°F ambient. Insulated lids. Expansion valve system for quick recovery. Built-in off cycle defrost timer assures optimum coil defrost. Performance rated refrigeration system utilizes environmentally safe R-134A refrigerant. Ergonomically friendly raised rail angled for greater ease and comfort when reaching to dispense food from pans. 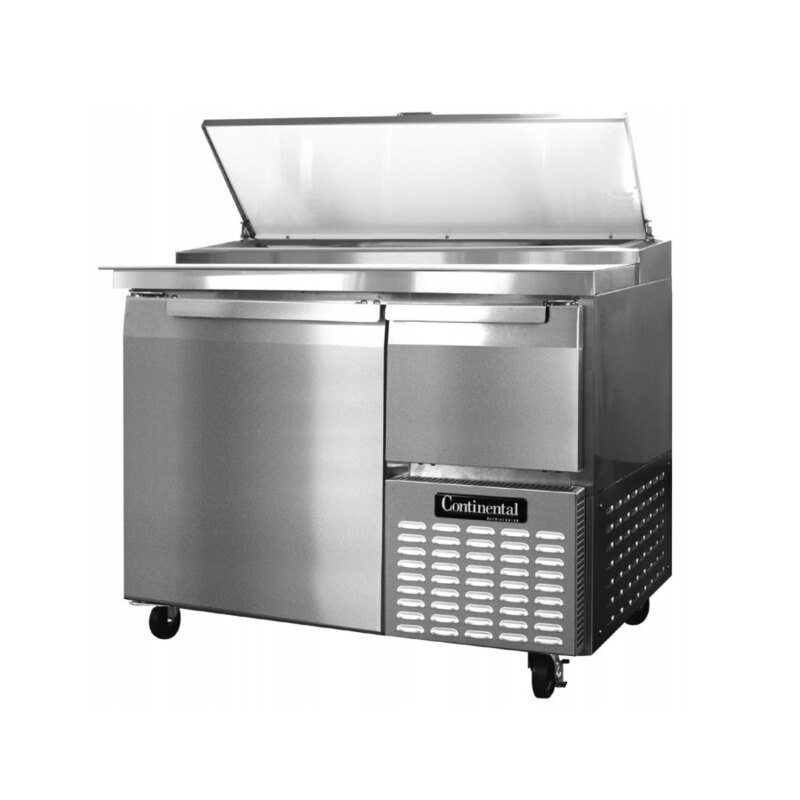 Easily servicable front slide-out condensing unit. High density non-CFC polyurethane foamed-in-place insulation. 5" swivel castors. Extra-wide 19" high density, full length nylon cutting board. Spring loaded, self-closing doors, magnetic snap-in gaskets. Heavy duty, epoxy-coated steel shelves. Interior hanging thermometer. 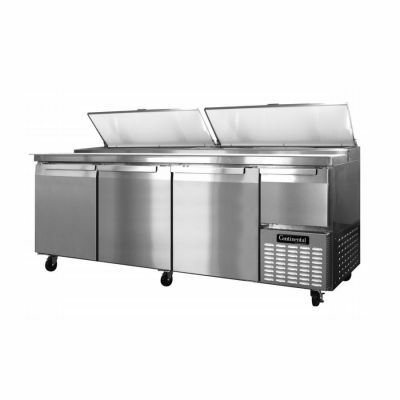 Cabinet construction consisting of heavy guage #300 series, stainless steel top, stainless steel front and end panels, aluminum, case back cover and interior. Non-corrosive, plasticized fin evaporator coil. Completely enclosed, vented and removable case back. Automatic, energy saving, non-electric condensate evaporator. 10' cord and plug attached. Field rehingeable doors. 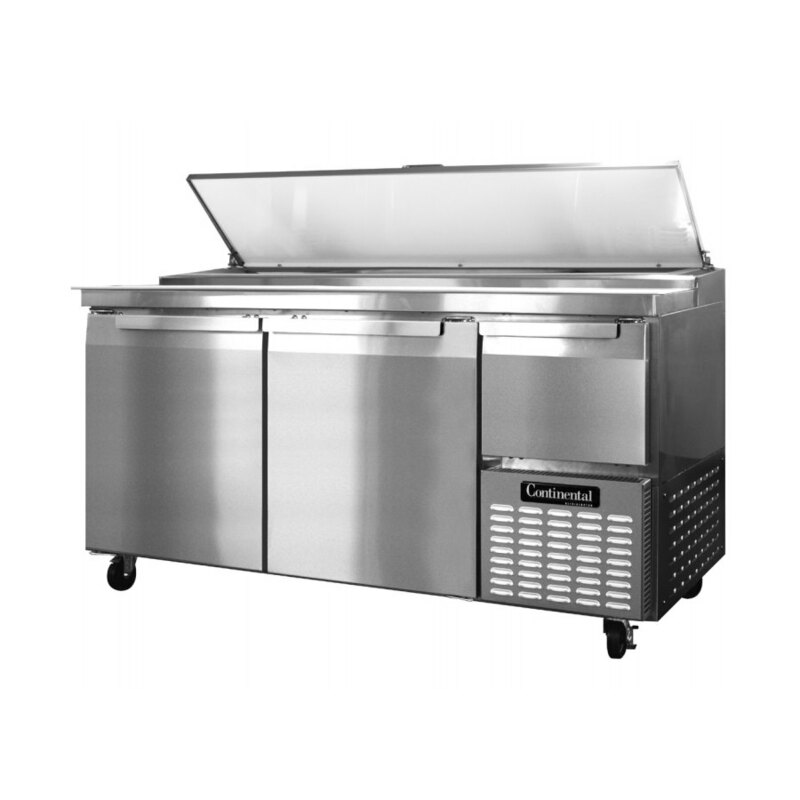 Offers more refrigerated storagecapacity by taking advantage of the space above the side mounted condensing unit with either a door or drawer tha can accommodate a 12"x 20" x 6" pan. 115V. CPA43 2610 1/3 43" x 36" x 39 7/16"
CPA60 3100 1/2 60"Â x 36" x 39 7/16"
CPA68 4200 1/2 68"Â x 36" x 39 7/16"
CPA93 5260 3/4 93"Â x 36" x 39 7/16"